This may look like an innocent rock, but it has a nasty past (assuming that you follow a certain set of Bronze Age beliefs and this is, in fact, the right rock). 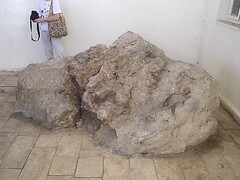 You see this lump of rock is allegedly involved in God's murder of Moses. You see, the rock first does it's magic trick of providing water when Moses is instructed to hit it by God. But then, 40 years later, God instructs Moses to talk to it. But he hits it, and water comes out. The punishment for tapping a rock? Murder before you reach the promised land. Sounds very reasonable and forgiving to me!